This weekend was cold and never really got much out of the teens temp wise, but I managed to get a few things done despite the cold. I had been considering the best approach for setting up a staging platform for the recore this spring. I finally decided to build a 'dock' across the front of the shed about 2 feet below the level of the boat's deck. Basically, I spanned the entire 14 foot shed with 2 rows of bolted together 2x4's with a 2x6 support in the middle of the span that was not up against the endwall. 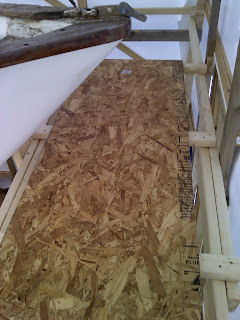 Onto this I screwed a few 2x3's and my last 7 foot piece of bowshed frame template plywood. I didn't spend a ton of time on this; knowing that it is just going to be ripped out at the end of the project. I only need it to support myself and provide an end platform for setting up side plank staging. The picks below aren't very good, but give you the idea. On the destruction front, I continued stripping the decks of any hardware and woodwork that will get in the way of the recore. 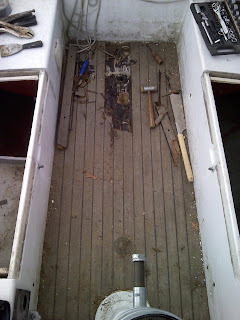 I pulled the companionway hatch, slide tracks and the wood underneath it (I was surprised at how much rot was in it). 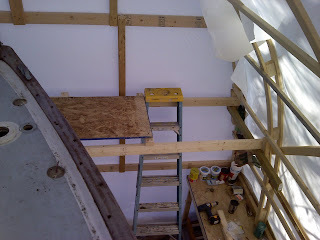 I am really close to ready to go with only the forward hatch hinges, mast step, and chimney to pull. On the not necessary at this time, but I just needed to know front; I pulled up the middle three teak strips on the cockpit sole to find out what was left of the rudder post that had been long ago buried when the wheel was installed. I had never been a fan of wheel steering on a boat this size, I much prefer the feel and simplicity of a tiller. However, somewhere along the way before I owned the boat, a decision was made to cover up the rudder post and offer no means of emergency steering should the wheel fail. Being 6'5", if this were to happen, there would be absolutely no way for me to get in and under the cockpit to get control and would need to hope that I was in a place where I could drop the anchor and call for help. To me, that is not a good option. My hope was that when I uncovered the steering tube the rudder post would be right there with some sort of keyway still in place where I could refit another tiller head.